If you’re working on a new technique- such as how to sew a kickpleat, its imperative to sew a sample. Making a sample is absolutely imperative to avoiding a migraine when working on your real garment! Yes, making a sample takes extra time, but the importance cannot be understated. 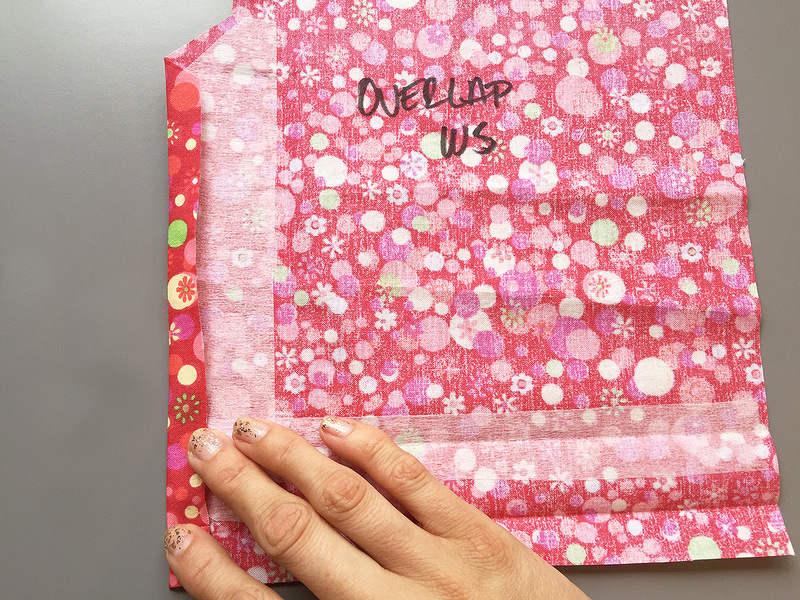 Cut out your fabric as you would any other project, making sure to clip the notches marked. Remember to not clip them too deep that they interfere with the sewing lines! At this point you’ll be pressing the notches marked Hem Fold and Finished Hem Line, using the notches as a guide. Identify what will be the underlap and overlap of the kickpleat. Be sure to make it obvious, just for your own sanity! For fashion fabric, I would maybe put a piece of tape on either the underlap or overlap– as it can get confusing later on. Cut out a total of three strips of interfacing to reinforce the kickpleat. This is not absolutely necessary- but I highly recommend it as it will stabilize the area and make the seams more crisp. I’m sure there are other reasons to do this as well, but I think the extra step is great: even after washing the area looks well put together. The size of the strips vary depending on your garment. For the two strips along the finished hem line, it should be the length of the garments back pieces. (Example: if you’re making a skirt that has three panels, the length should be from the center back to the side seams) The width of these two strips depends on the hem. For this example, my hem is a total of 1″, so I cut the strips roughly at 5/8″. If you have a wider hem, I would make the strips wider as well. When placing the interfacing, overlapping the seam line slightly: remember, this interfacing is to stabilize and strengthen your stitches. The third strip of interfacing is for the overlaping kickpleat. This one should be a little bit wider, but as stated, can vary depending on your needs. For a 2″ extension, I made the strip roughly 1 1/2″, cutting the upper edge at roughly 45*, and interfacing it slightly over the center back seam line, again, to reinforce those stitches. Each side of the kickpleat needs to be tackled individually. 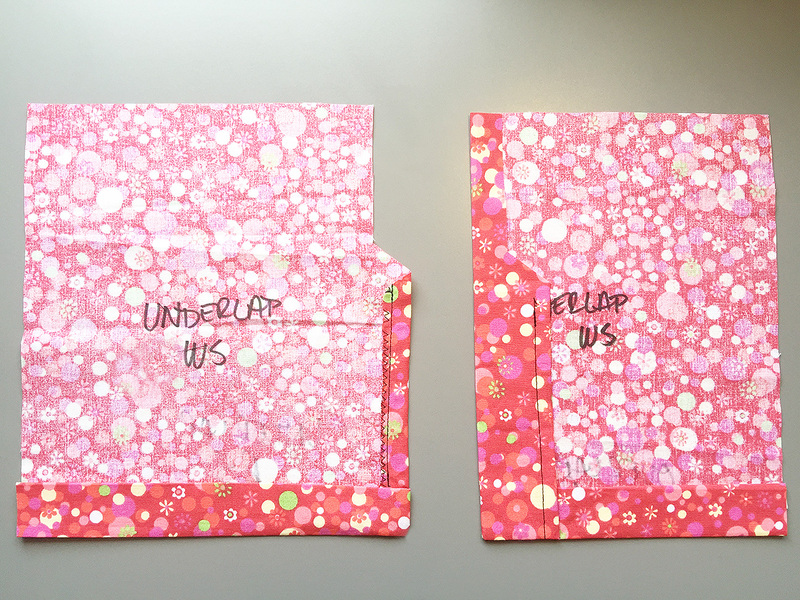 I will be starting with the underlap. Using the notched guide, finger press the hem fold (which should have all ready been pressed by an iron in the previous section so you’ll have that as an additional guide), press the Wrong Sides together. Then use the Finished Hem Line notch and fold to finger press the fabric backwards, Right Sides together. Pin. The middle image shows what this should look like from the Right Side. Take to the sewing machine and sew only up until the Finished Hem Line. At this point I would think about finishing techniques. If you own an overlock machine, now would be the time to pull it out. In my case, I used a zigzag stitch. Also, clip the the corner, as this will help you avoid a bulky and ugly corner- yuck! Now for the corner turn. Essentially you’ll be sticking your thumb into the corner you just clipped, and turning the hem to the wrong side. Press once you’ve got the corner all pushed out. You’re almost done with the underlap! Tack down the seam allowance however you see fit. For this example, I did a simple straight stitch but you can also use a blind stitch. Please note that when you’re walking, this seam line will be visible. At this point you can also go ahead and tack down the hem with a fell or blind stitch. Now we can move onto the overlap. First, press down the kickpleat extension seam allowance. Remember, if you notched your pieces properly from the beginning, this will be easy to do. Finish the seam allowance however you decided to finish the underlap portion, including tacking down the seam allowance. Fingerpress the kickpleat extension piece along the notched guide, pinning it in place just above the Finished Hem Line. Sew along the Finished Hem Line, but only as far as the edge of the kickpleat extension. Clip the corner- but only on one layer (the one with the finished seam allowance.) If you clip the entire corner, it will become unstable. One layer is enough- remember you’re just trying to reduce bulk. Now again, a fun corner turn. Press everything down along the guides you’ve made earlier and tack down the hem and kickpleat extension. You should be somewhere in this zone if you’ve done everything correctly! As you can see, the underlap portion is actually bigger than the overlap. Essentially, the overlap will be covering the extension present in the underlap. Now we can continue to actually getting the two pieces connected. Align the top of the fabric. Pin in place all the way to the 45* angle, then sew according to your seam allowance, pivoting at the corner and sewing until the kickpleat edge. Clip the corner as shown, being careful to not clip into the stitch line! Press the seam allowance open as shown. In the above picture I’m pointing at the final line that will need to be stitched. Using the line as a guide, you’ll essentially be sewing over it a second time to reinforce the kickpleat. This is vital- that area in the garment will be seeing a lot of wear every time you take a step. I pinned the area in place and then took the fabric back to my sewing machine, making sure to hold the thread legs with a good amount of tension to avoid a knotty rat on the Right Side of the fabric. Remember that this final stitch will be visible from the outside- so take care in setting your machine settings correctly, and sewing evenly and straight along that line. Taking the extra time to learn how to sew a kickpleat properly makes a difference in the final garment, making it look more professional. It also holds up so much better in the wash.
How to Use a French Curve, Video Tutorial! Previous Post Sewing Tips for Vintage Simplicity 1460, with Video! Wonderful tutorial! I love that you included how to add a clean finish for the hem. So glad the tutorial helped!! Fantastic set of tutorials (drafting and sewing). Other kickpleats I’ve done I had to redo at least twice because the instructions made no sense. This made the perfect kickpleat first time around! So glad the tutorial helped! I was in the same boat right before I nailed this one down on the post; too many confusing tutorials and not enough pictures! Im a massive kick pleat fan! Really finishes off a skirt beautifully! Plus you can walk easily, win win!!! Great tutorial, super clear and easy to understand. Thanks for checking out the tutorial. I actually had to reference it myself when I was working on my last project, patting myself on the back for making it easy for future-me- haha! Thank you! When I was working on this technique myself the tutorial landscape for it was pretty abysmal. Hopefully someone else finds some use in it as well.